Overview-How Can Ultimate Gold Detox Help You? Not having enough time to detox ahead of a drug test has prevented hundreds of recreational drug users from getting jobs. This is where drinks like Ultimate Gold Detox come in handy. Use of a product such as this is an urgent solution to a serious problem. Despite the increasing legalization, acceptance and use of the recreational drugs such as marijuana, most workplaces still maintain a strict no drug policy. Taking recreational drugs such as marijuana might be fine on your own time. However, employers worry that their employees might someday show up for work under the influence. This could result in poor or erratic service and complaints from their customers, which would adversely affect their business. Even if you find out about a potential drug test a few hours in advance of your job interview, a product such as Ultimate Gold Detox might work fast enough to help you pass the test. If you want to avoid this situation, you can look up in advance on the Internet whether the business for which you are seeking employment drug tests their applicants ,or not. Or better yet, ask people who already work there. It’s important to know, however, that detox products like Ultimate Gold Detox aren’t 100% effective or medically cleared. There has been no medical research on these products. So they’re not FDA approved and their safety can’t be guaranteed. Avoid using detox drinks if you’re pregnant, suffer from kidney or liver disease, or are on prescription drugs. Those on prescription drugs don’t need to worry about failing a drug test because of these drugs. If you’re on barbiturates that were prescribed by your doctor for example, just let your potential employer know that you’re on a prescription. As a result, you won’t have a problem passing your test as long as that is the only drug in your system. Most Ultimate Gold Detox sellers claim that the drink works by cleansing the body of toxins. Unfortunately this is not an accurate statement, as is the cases with most detox drink manufactures/sellers that claim to provide body detoxing. They all claim that such detox drinks have specific ingredients that purify the body of drugs and toxins, but ultimately the reality is that these drinks only dilute the urine. Ultimate Gold Detox works by making the body produce more urine and flush the kidneys so that your urine appears diluted. By producing extra urine, the concentration of drugs present in your urine sample appears low. This is what Ultimate Gold Detox relies on-making the concentration of drugs below the cutoff levels that prohibited substances are detected by tests. This is good news in that it is nonspecific and should work for marijuana as well as other drugs. There aren’t too many unknown ingredients present in Ultimate Gold Detox. This makes the product considerably safer to use than any of those products with a multitude of unknown ingredients. The product mostly consists of water and vitamins. These will be discussed a bit later. As Ultimate Gold Detox contains aspartame, it should be avoided by those suffering from phenylketonuria. Ultimate Gold Detox comes in a 20 oz bottle. It should work in less than 45 minutes and its effects should last for up to 5 hours, making it a decent option for those undergoing a surprise drug test. These ingredients are mostly harmless, but don’t really help the body get rid of drugs and toxins. They just increase the urine output in order to make your urine dilute. Creatine is included in the product in order to keep its concentration constant in urine as low creatine in urine raises the suspicion that the urine was intentionally diluted. People who suffer from phenylketonuria should NOT use Ultimate Gold Detox as the aspartame might have serious negative impact on their health. Minimum 48 hours before using Ultimate Gold Detox drink, you must STOP using marijuana. The longer you refrain from using marijuana, the easier it is to mask the toxin in your urine. Wait 15 minutes then refill the bottle with water and drink it all again. Urinate 2-3 times within an hour of drinking Ultimate Gold Detox. 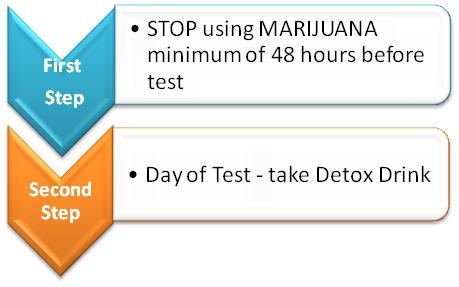 Try not to use marijuana at least for a few days before your drug test. Don’t eat a large meal before using Ultimate Gold Detox. Contains creatine to help with dilution. Pretty easy to use as you just drink the bottle then refill it with water and drink again. Hasn’t worked for many people and has some negative reviews. NOT to be used by people with phenylketonuria. Not FDA approved or medically tested. For any assistance regarding Ultimate Gold Detox, contact www.amazon.com using email, phone, or online chat and they’ll be able to provide you with the assistance you need and answer your questions. Ultimate Gold Detox is a decent option for people who need to get ready for their urine drug test as soon as possible. According to recent reviews, it works best for light and moderate users if they abstain from drugs a few days before their test, drink lots of water, and exercise a lot. However, it is unlikely that his product is effective for heavy users – unless they abstain from using marijuana or other prohibited substances or have completed a whole body detox program. So if you can follow our tips for the best results and recommendations, you might get the results you are hoping to achieve. Hope you found our Ultimate Gold detox review helpful. If you have any prior experience using Ultimate Gold detox then please share it with us in the comments section below. Surely others trying to find the best way to detox will benefit greatly from your experiences.